Whether you're a fan of the series or not, you've likely heard of the Five Nights of Freddy games. What you may not be aware of, however, is that owe their existence to another less favourably received game. 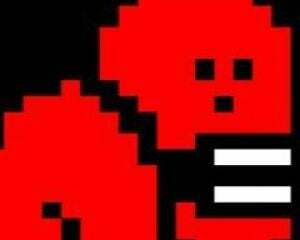 Creator Scott Cawthon's previous game, Chipper & Sons Lumber Co, was criticised for its characters' manic, unblinking and frankly terrifying expressions. Cawthon apparently felt that he could create something that was intentionally scary, which lead to the creation of Five Nights at Freddy's. So it's only fitting that Chipper, star of the game that started it all, should put in an appearance in his latest game, Five Nights at Freddy's World. Unfortunately, this self-referential cameo is one of the few interesting or intriguing things about the game. FNAF World isn't a direct continuation of the Five Nights at Freddy's series, and was instead pitched as a separate game. The game eschews the static first-person perspective of the previous games and instead transplants the characters into a brightly coloured top-down role-playing game. 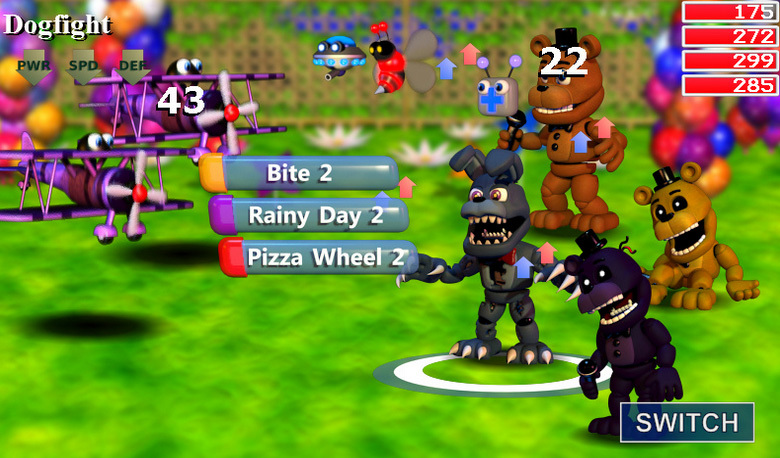 FNAF World was actually released about a month ago, but was missing several critical features. Most notably, while the game did let you play as cutesy versions of the Five Nights at Freddy's characters, it was impossible to tell exactly what their attacks did. This new and improved version of the game addresses those concerns and has in fact been made available for free, partly as a way of apologising for the game's initial release. Suspicious sort as I am, I half expected the game's family friendly appearance to be some sort of elaborate feint. 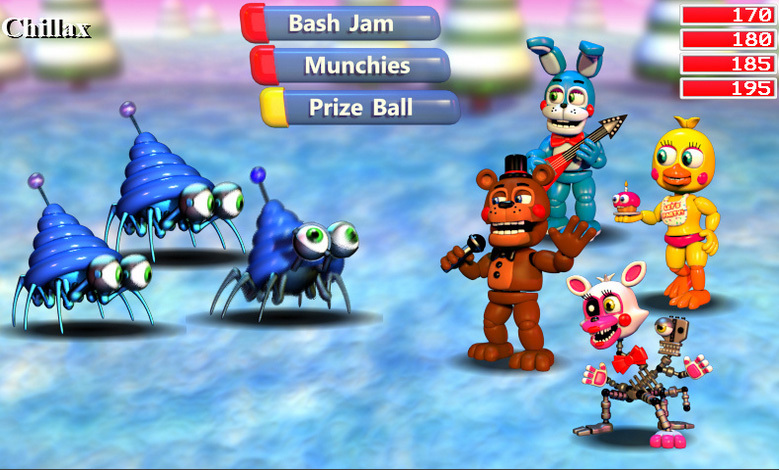 I was greeted by FNAF World's colourful graphics and pleasant upbeat music, indicating that nothing was massively amiss – although the animation seemed a little basic. I still anticipated that I would break through the game's thin veneer and find myself plunged into a more familiar world of terror. But no, FNAF World is actually a fairly conventional role-playing game, complete with side-by-side battles, levelling up and other traditional RPG features. That in itself didn't put me off the game, by any means. I'm a huge fan of Undertale and while I didn't expect FNAF World to match up to Toby Fox's divisive RPG, I at least hoped the game would prove to be an entertaining experience. I was sadly mistaken. Two hours later, after wading through wave upon wave of foes and having weathered countless random encounters, I still wasn't having fun. I'd unlocked several other characters, though there was no real incentive to use them since they all started at level 1, well behind my current characters. I'd also purchased several upgrades, including more powerful internal metal frames, for my animatronics characters. This in turn lead to me steamrolling most foes without any real challenge. The only thing keeping me playing was the thought that I needed to give the game a fair shake for the purposes of this review, but at the two hour mark, I decided I'd had enough. There problems with FNAF World are twofold and they ultimately doom the game to mediocrity. The game's primary failing is that there's no real substance to the game's storyline, with only the vaguest of hints as to what's taking place or where you should be going. It's true that Five Nights at Freddy's storyline was similarly sparse, but that title's core mechanics were strong enough to sustain interest in the game. Secondly, the RPG elements of the game are distinctly sub-par. Combat is a clunky, imprecise affair and while being able to switch between two teams is a mildly interesting twist, it's overshadowed by the fact that you can't switch between individual characters, or check their statistics. There are also no sub-quests to take you off the beaten path, so you typically end up wandering, grinding foes to level up, with no real objective in sight. 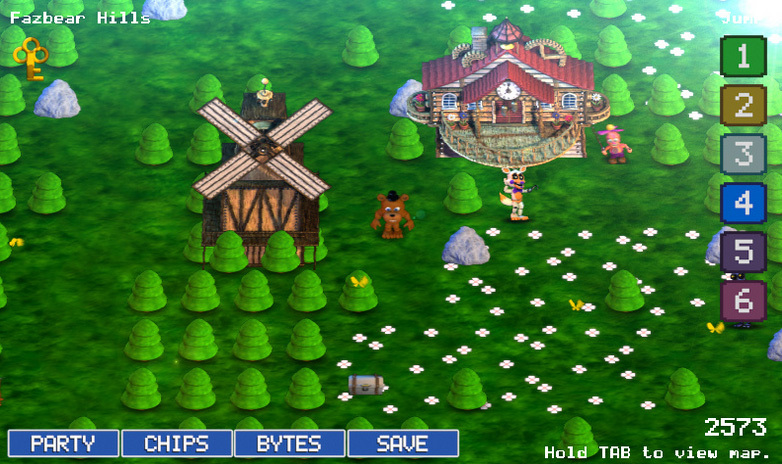 While Scott Cawthon should be lauded for trying something new – each Five Nights at Freddy's game offering a different spin on the formula – FNAF World just doesn't work. It's wholly lacking in substance, or indeed any of the lore that pervaded previous FNAF titles. There were odd moments in the game that piqued my interest – such as the blocky glitched areas you occasionally travel through – but these were far and few between. FNAF World is an idea that presumably sounded good on paper but which has failed to lead to an enjoyable or engaging game.